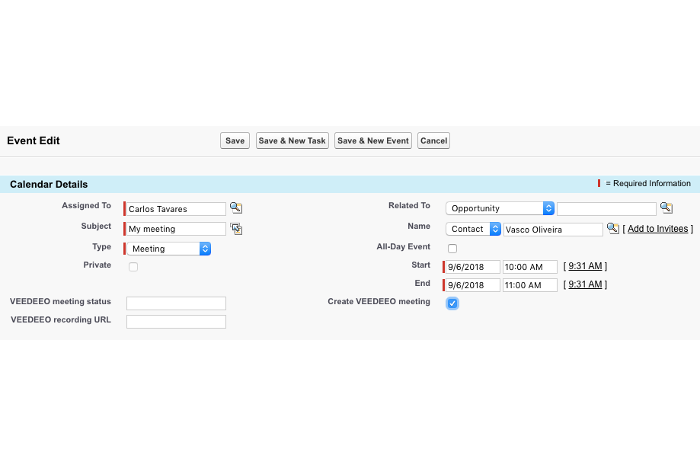 VEEDEEO for Salesforce enables you to easily create and join video meetings right from your Salesforce Events object, streamlining the usage of your VEEDEEO platform from within your favorite CRM application. This page describe how your users can use the VEEDEEO for Salesforce integration in their day-to-day activities. To use VEEDEEO for Salesforce integration, please make sure your Salesforce Admin has completed the post-installation activities as described in this page. If you need help configuring the VEEDEEO for Salesforce app, please contact our support team. 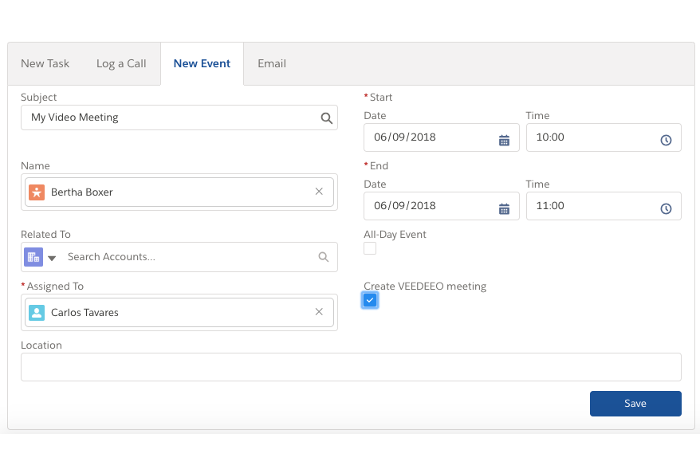 To create a video meeting from within Salesforce, you just need to flag the "Create VEEDEEO meeting" field when creating an Event in Salesforce. After saving your Event, in a few seconds your Salesforce will create the video meeting at VEEDEEO and send all participants (including yourself) a calendar invitation with the instructions to join the video meeting at the scheduled date/hour. arrow_forward "View" - if the video meeting has not started yet and it is not within the entry timeframe (30 minutes before scheduled date/time). You can use this link to access the video meeting detail page in VEEDEEO. arrow_forward "Join now!" - when the video meeting is within the entry timeframe. You can use this link to join the video meeting using your browser, at the meeting scheduled date/time. *Note: the video meeting calendar invitation is sent directly to the email of the participants (to the calendar associated to each participant email) - the video meeting instructions are not reflected in your internal Salesforce calendar. When you change an Event for witch you have created a video meeting, the corresponsing video meeting will also be changed in VEEDEEO. When the video meeting is changed, VEEDEEO will automatically send all participants a calendar invitation update to reflect these changes. When it's time for your meeting (at the scheduled date/time), you can join your video meeting using the several options described in the calendar invitation sent by VEEDEEO. When you use the "Join now!" link, your browser will open a new window, from where you can enter your video meeting. To connect to the video meeting, simply press the blue "Continue" button and wait a few secconds for the connection to estabilsh. Note: the video meeting will only be deleted in VEEDEEO if it has not started yet. If you need help using the VEEDEEO for Salesforce App our have suggestions for improvement, please contact our support team.